This fall TCX is bringing a new tall engineer boot to their line-up in the form of the TCX Fuel WP Boots. 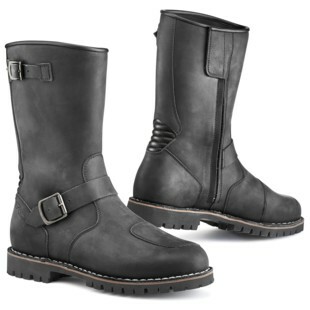 At first glance, you could mistake the TCX Fuel WP Boots as an authentically vintage boot. TCX is using "ideal" construction, a footwear industry term, to give the classic look and appearance of a hand sewn boot sole. This contrast is especially striking in the vintage brown colorway. Even the side zipper, with placement for easy ingress and egress, blends into the boot and does not upset the aesthetic. The TCX Fuel WP Boots will not leave you dry either. They are waterproof and come with other TCX standard benefits like medial and lateral malleolus discs, reinforced toe and heel counter, anatomic and replaceable insole, and a deep tread pattern to keep you gripping the road in slippery wet conditions. In short, the TCX Fuel WP Boots are going to be a welcome addition for riders wanting to up their protection and comfort without sacrificing appearance.